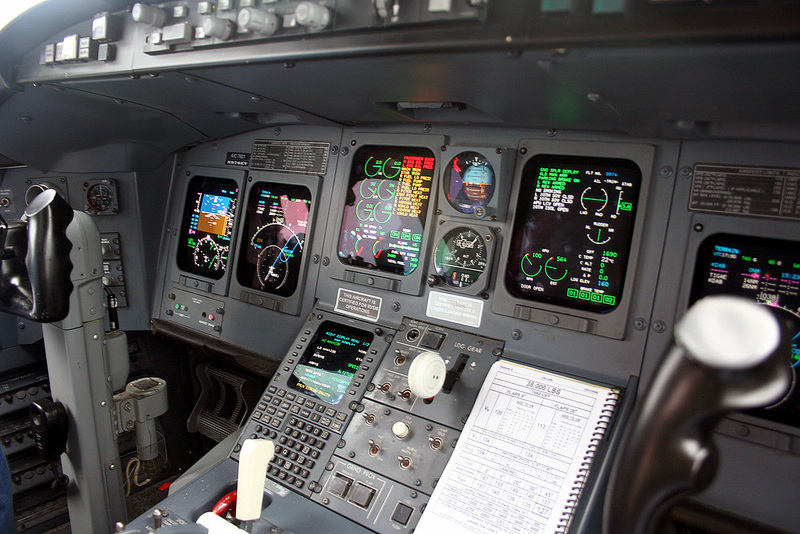 The Bombardier CRJ200 avionics are powered by the Rockwell Collins Pro Line 4 avionics suite. Six tube style screens make up the display portion of the CRJ200 avionics. There are two primary flight displays and 4 multifunction displays. The two multifunction displays in front of the pilot / co-pilot usually display navigation information from the CRJ200 avionics system. A Bombardier CRJ200 FMS unit, the Collins FMS-4200, is made part of the CRJ200 avionics system. One or two Collins FMS-4200s are included in the Bombardier CRJ200 avionics. CRJ200 avionics are supported by a two attitude heading reference systems (AHRS). A traffic alert and avoidance system (TCAS II) is also apart of the Bombardier CRJ200 avionics system. The Autopilot system is controlled by the Collins FCS-4000. Also a color radar system is made part of the Bombardier CRJ200 avionics system, the Collins TWR-854. The Rockwell Collins Pro Line 4 avionics suite is now considered to be a legacy system as Rockwell Collins has released the Pro Line 21 and Pro Line Fusion avionics suites. The Bombardier CRJ200 avionics are also known as the Bombardier CRJ-200 avionics, Bombardier CRJ 200 avionics, Bombardier CL-65 avionics, Canadair CRJ200 avionics, CRJ200 aircraft avionics and the Bombardier CL-600-2B19 avionics. Above Bombardier CRJ200 Avionics Photo by egmTacahopeful on Flickr. Photo (only) released under a Creative Commons License.